Sometimes it feels like I’m just treading water, going nowhere. Simply staying afloat. It’s during those times that I tend to take on projects, maybe because I need something to dive into or some material thing to account for my time. Usually these projects have a predictable end upon which they get photographed and planted on Facebook. My newest project is different. 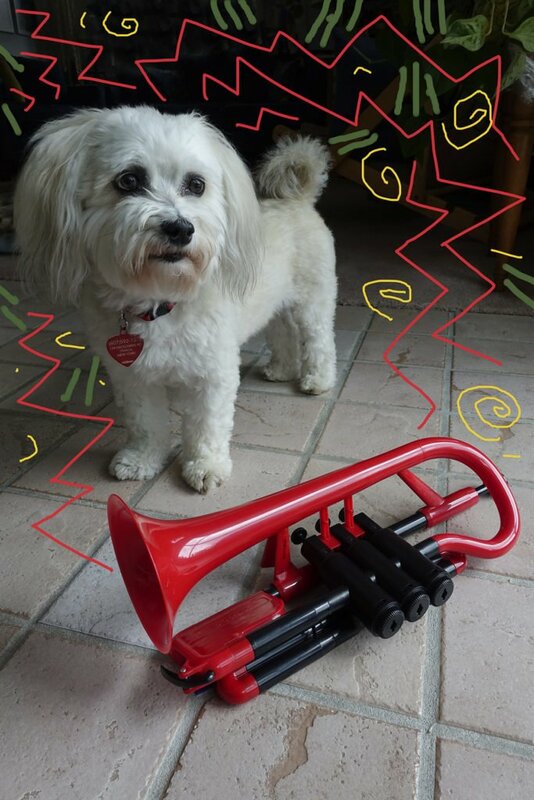 “I want to learn to play the bugle,” I told the guys at Hickey’s Music Store, last week. They put me in a tiny room to spit and blow raspberries into a rental trumpet, until I hyperventilated myself to exhaustion. They sold me a red plastic cornet. Cheaper than renting an instrument, we all understood a stunning bugling career was unlikely. As a kid, I roller-skated over the cracked basement floor to recordings of John Philip Sousa marches and US military bugle calls. Bugle calls followed me through decades of summer camps, signaling wakeups, bedtimes, and changes in activities. This past winter something got me searching the internet for these calls, bookmarking various sites on my computer so I could play them all hours of the day. And one day, I came up with the notion I should learn to play Taps myself. It was only four tones. Twenty-four notes. Old, puny, and never very musically inclined, I hoped I had enough resolve to learn the four tones. It’s not like I needed another project. Certainly not one that keeps me holed up in the house with windows shut tight to keep neighbors from hearing the horrible racket. The dog hides behind a wall when I practice. She peeks out at me in disbelief at the only sound I could produce for days, blasts that brought up images of an elephant yowling with bellyache. But yesterday I managed a second sound, somewhat like a foghorn. The dog crouched closer, cocking her head. And today I added a screaming duck call to my repertoire, though I still can’t control which of these noises will spill forth. For this project there will be no end product to display on Facebook. From the start, I knew I would invest a lot of time and energy just to produce one beautiful solid note. I went into this hoping to be able to play one tune to my own satisfaction. What I didn’t know was that the reward would not be in the tune, but rather in the witnessing of progress in its rawest form. I’m experiencing slow but steady increments of improvement forged by dedicated effort. What a simple strange joy. What’s your latest project? Why do we take on projects? What brings you simple joy? This entry was posted in 2018 and tagged determined to do something, difficult endeavor, embouchure problems, I want to play taps, learning to play a bugle, posting on facebook, taking on a project on 2018/08/13 by Robin Botie.